are meridians that flow deep within the body, act as reservoirs of qi and blood for the main meridians (filling and emptying as needed), circulate jing around the body, circulate defensive Wei Qi to increase immunity, and provide a connection between the 12 main meridians. The eight extraordinary meridians help with deep illness (physical, mental, or emotional). They are used to deal with issues of ancestral ties, fertility, life purpose, chronic illness, asthma, digestion, and much more. I find them extremely useful in clinical applications and use them on almost every patient I treat. Coupling pair: Lieque (Lu 7) and Zhaohai (Ki 6). The Ren receives and transports the qi of all the yin meridians, and therefore regulates the uterus, menstruation, menopause, pregnancy, etc. Since the master point is on the Lung channel, it is associated with respiratory syndromes, e.g., childhood asthma. 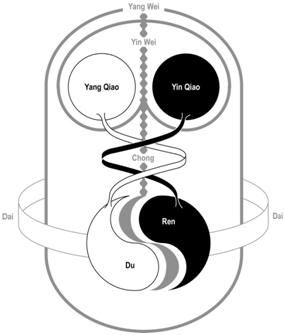 The pairing of ren mai and yin qiao mai, with its attendant Lung/Kidney relationship, energetically affects the lungs, chest and throat, and is very useful in a clinical situation, especially in addressing breathing imbalances. Also useful for bonding issues between mother and baby that may extend into adulthood with being overly independent, incontinence, protective repression, or fibroids. I also use it on patients who were Caesarian-section babies as they tend to have lung and skin issues (asthma, psoriasis, eczema, etc). Essential oil pairing: Neroli and Ginger. The Du governs the qi of all the yang meridians, it addresses the entire spine. It is effective in treating stiffness in the shoulder, neck and back, and also regulates the inner canthus of the eye. The Du also nourishes the brain, and treats dizziness and tinnitus. On an energetic level, the Du relates to transformational cycles, survival issues, and groundedness in the world. Psychospiritually, issues of becoming “upright” and independent, going out on one’s own journey, as well as risk-taking. Essential oil pairing: Cedarwood and Cinnamon leaf. The Chong is known as the “Sea of Blood” and affects the heart, chest and stomach. It is the cosmic architect and creates the blueprint of your life. The Chong regulates the flow of qi and blood in the 12 regular meridians, and is significant in gynecological disorders, digestive issues, prolapses, and problems with the heart. It runs through the center of our body. Energetically, it relates to intergenerational patterns, issues arising from abuse, and cellular memory. Psychospiritually, an imbalance in the Chong meridian negatively impacts our self-acceptance and self-love. Essential oil pairing: Angelica and Patchouli. The Yin and Yang Wei Mai function as connecting or networking vessels. They also help to maintain the balance of the body’s yin and yang. Because of this, they relate to the transitions involved in the aging process (7 year cycles for women, 8 year cycles for men), and the accompanying transformation of yin or yang energies. The Yin Wei allows energetic access to the Neiguan, the inner gate to the self. Heart pain (physical or emotional) is a major symptom that we are not fulfilling our life’s destiny. The Yin Wei Mai can clear this stagnation. Psychospiritually, this vessel is concerned with the meaning that we derive from life, and helps us to respond to life with clarity and compassion. It allows us to link our past and our future and to help the aging process. I find the Yin Wei very helpful in patients that just need some extra TLC. Essential oil pairing: Rose and Melissa. The Yang Wei dominates the exterior of the body, and is relevant in conditions of chills and fever. It is also helpful for ear issues, arthritis (bi syndrome), tossing and turning, watery itchy ears/eyes/mouth, low back pain and one-sided pain. Energetically, it regulates our old habits and patterns, and the release of these pre-established modes of behavior that prevent us from evolving. The Yang Wei Mai will help us move ahead in life. Psychospiritually, since the Yang Wei Mai represents the last stage of defense before the body is penetrated by an invading pathogen, this meridian can be used to treat issues of terminal illness, such as cancer or AIDS. Essential oil pairing: Rosemary and Citronella. The qiao vessels originate on the inside/outside of the heel, add agility to the body, and govern motion, especially that of the lower limbs. The Yin Qiao deals with energetic imbalances in this meridian, manifestations include left/right imbalance, inversion of the foot, osteoporosis, pain in the eyes, insomnia, somnolence, tumors, hypothyroid, and auto-immune issues. Psychospiritually, there are issues of self-trust, abandonment, depression, syndrome of low self-esteem/self-destructive behavior, and feelings of unworthiness. Essential oil pairing: Narcissus, Jasmine, and Juniper. The Yang Qiao is useful with syndromes that include a sensation of “walking on a slant,” excessive thinking, and a generalized feeling of being overwhelmed and out-of-control. The Yang Qiao Mai treats conditions such as insomnia, hypertension, hyperthyroid, epilepsy, asthma, bladder issues, Parkinson’s, facial paralysis and Bell’s palsy (related to wind in the face). Essential oil pairing: Basil and Cinnamon leaf. The Dai Mai is the only meridian that runs horizontally – it encircles all the other meridians. The Dai is helpful with damp conditions, feeling as though the lower half of the body is submerged in water, phlegm, tumors, fibroids, prolapse uterus, muscle atrophy in the lower limbs, and low back pain. Energetic issues involving the Dai Mai, can manifest in a person “near to tears” from frustration, indecision or low self-esteem. The Dai is the depository for post-natal junk, anything the body cannot transform will go into the Dai. When we need to make a decision and cannot decide we push it to the back of the mind. It is held in the Dai. To clear it we need to clear the accumulation and what happens when we clear emotions, we cry. The opening point Zulinqi (GB 41) is translated as the foot container of tears- an appropriate point for helping us let go of our deeply-held emotions. Juliao (GB 29) is often used to help as it gets us to move forward in life. Psychospiritually, this meridian is a repository for unexpressed emotions and psychological complexes that require transformation, secrets, traumatic issues, and Pandora’s box. The repression of these shadow aspects of the personality may give rise to dampness of body/mind/spirit. Essential oil pairing: Mugwort, Niaouli, and Sandalwood.